The Cliffs of Moher (Aillte an Mhothair in Irish), which are located in County Clare, are one of the most visited natural sites in Ireland. 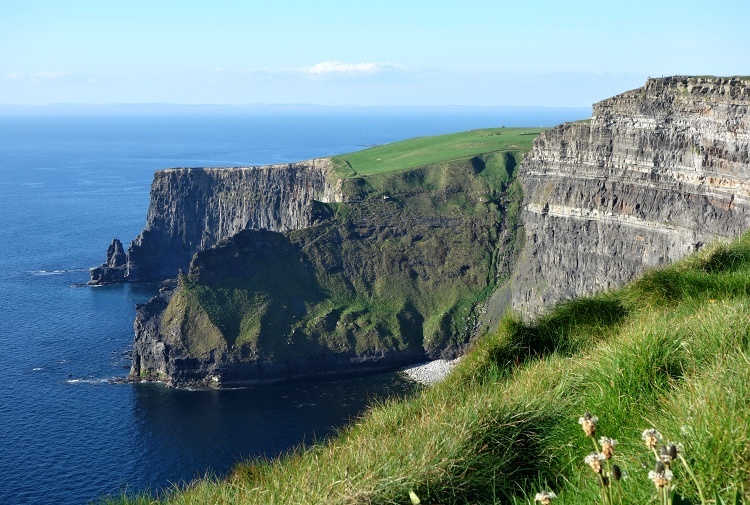 These dramatic cliffs are 214 metres (702 ft) high and provide beautiful views of the Atlantic Ocean, Aran Islands and west coast of Ireland. Our relationship with the Cliffs of Moher is complicated and it has had its ups and downs. 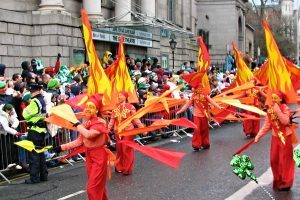 In the last decade we have visited the area many times, either on our own or with friends who came to Ireland to see us. We admired the cliffs first but with every visit we tended to find them less appealing. 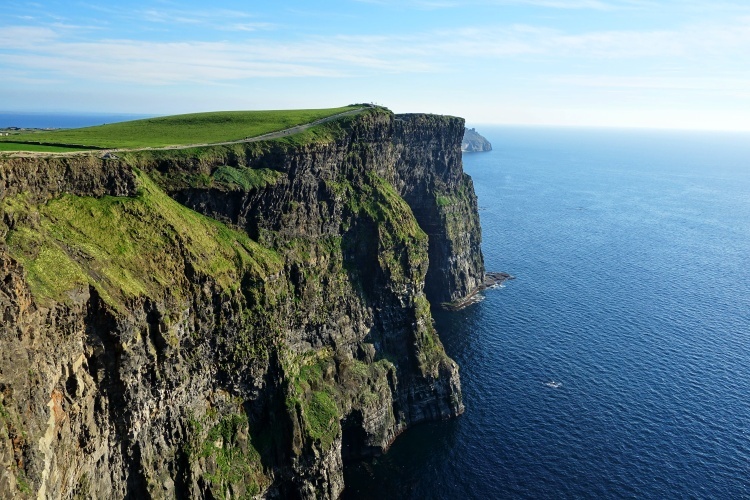 The Cliffs of Moher pay a high price for being one of the most visited attractions in Ireland. The place has lost a big part of its magic because of the crowds. The seemingly never-ending stream of visitors has made the enjoyment of the majestic beauty of the cliffs difficult. It has become hard to even find a spot for a decent photo. After a few visits we gave up and we didn’t come back for a long time. But things change. We were on a trip in County Claire in May this year and we were passing by the Cliffs of Moher on the way back from the Aran Islands. We had a while to spare so we decided to give the cliffs one more chance and see if anything had changed after the years. We are so glad we made this decision! We arrived late in the afternoon and the crowds were gone. How different and peaceful the place looked! We almost had it to ourselves. It was the first time when we could stop and admire the cliffs without trying to avoid selfie sticks. The facilities and the visitor centre have been improved and the site has become more visitor friendly. To be fair – we were really lucky with the weather and the blue sky also made a difference. In the past, we usually got rain, fog and wind, which was very Irish indeed, but not very enjoyable because of the poor visibility. 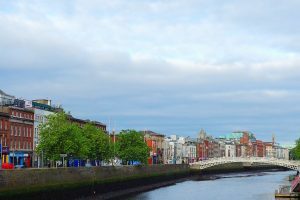 The closest airport is Shannon International Airport (SNN), which offers connections from the USA and some European countries. You can join some of the bus tours originating in many cities in Ireland (Dublin, Galway, etc.) but we recommend hiring a car and driving on your own. 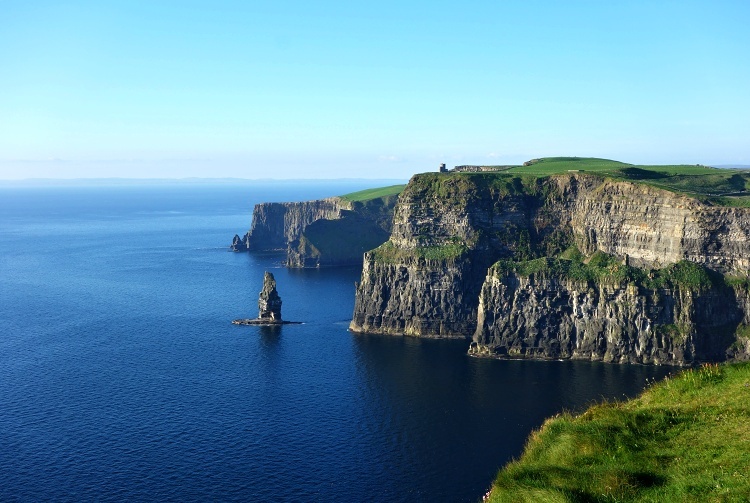 The Cliffs of Moher are located on the famous Wild Atlantic Way, which is well-signed so the navigation is easy. The narrow and winding local roads are not only pretty but also challenging so you need to drive carefully. 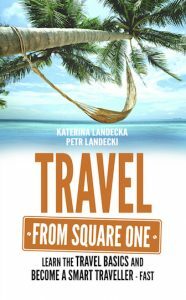 Be aware that there are many tourists from all over the world driving in the area and they might not be used to driving on the left-hand side. We almost had an accident when a car was coming from behind the horizon. The driver obviously forgot that he should have been driving on the left-hand side of the road and nearly crashed into us. Fortunately, we were both driving slowly so we managed to stop when we spotted each other driving in the same lane. Public buses are also available but the service is limited. That is why it is a good idea to plan your visit and check the timetable for the route number 350 before you go. If you are an outdoor lover you can walk along the coast from Doolin or Liscannor. Cycling is also popular, and you can hire bikes in Doolin or Lahinch. The experience at the Cliffs of Moher is very dependent on the weather, which can be quite unpredictable in Ireland. It can change fast so always be prepared for the rain and wind. If it is foggy or raining heavily you won’t be able to see much. Summer (July and August) is the busiest time of the year and the site gets very busy. That is why we recommend visiting the cliffs in May, June or September. Your chances of decent weather are also relatively good during these months. Try to avoid weekends and bank holidays to avoid the crowds. Arrive early in the morning before the site opens or late in the afternoon before it is closed. We were glad that we were there in the evening because we could enjoy the beautiful sunset. Allow at least two hours for the visit so that you can explore the area. If you arrive by car you will be charged the entrance fee (6 EUR per adult in 2016) when entering the parking lot. 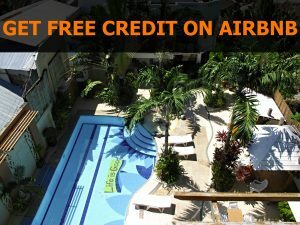 You can save 10% if you book the tickets online. If you join a tour, the ticket should already be included in the package price. 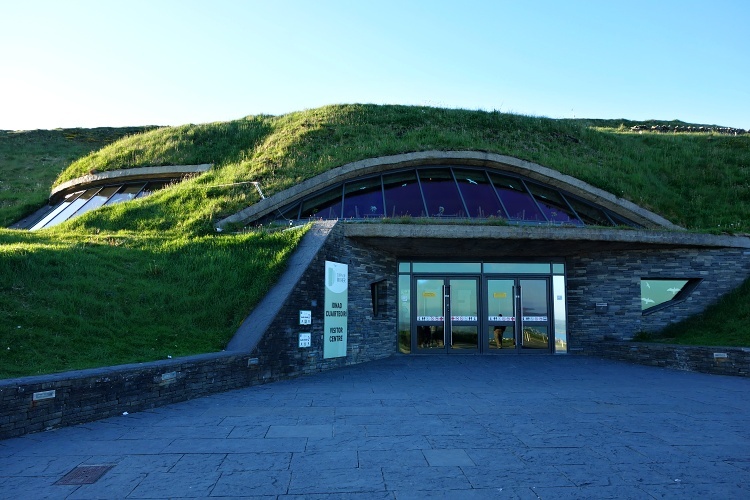 But if you arrive any other way (by foot, bike or taxi) and the outside ticket booth is closed, you should go to the Visitor Centre and buy your admission ticket there. If you arrive early or late and the Visitor Centre is closed, you can still access the area without paying. The site opens at 9am all year round (the Centre only closes at Christmas), but the closing hours are different for each month so verify the details online here before you go. When arriving at the site you will see the Visitor Centre first. It is located on the right-hand side and is hidden in the hill. It is a cool building in the Hobbiton style. If possible, don’t miss it and go inside. The Cliffs Exhibitions with their many exhibits, displays and experiences will help you learn more about the cliffs. You can also find some shops and cafés there. When you get to the cliffs’ edge you can either follow the path to the right or to the left. Start on the north platform and turn right. You will get the most famous views of the cliffs that you probably know from postcards. The photogenic O’Brien’s Tower is the main landmark. It was built in 1835 by local landlord Cornelius O’Brien as a viewing point for the visitors. You can access it for a small fee (2 EUR per adult in 2016). It is not open all the time so check out the opening hours at the Visitor Centre. 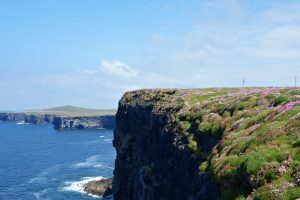 If you have time and you are in the hiking mood you can follow the trail and walk to Doolin, which is a small village located north of the cliffs (8 km/5 miles). 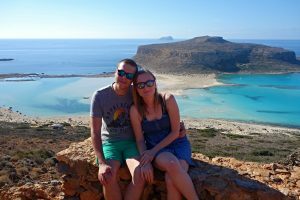 The south side of the cliffs is our favourite – it is less spoiled and not so busy. The path is natural and there is no wall on the edge, which would ruin the views. After you leave the Visitor Centre turn left and then follow the coast. It is a pleasant walk and the views are stunning. It is a great spot for bird watching, because you can find one of the major colonies of cliff nesting seabirds in Ireland here. You can see (and hear) puffins, razorbills, guillemots, kittiwakes and choughs. Most people don’t walk too far so you can escape the crowds after a few-minutes walk. The path leads south to Hag’s Head (6 km/4 miles) and Liscannor (6 km/4 miles). If you would like to explore the cliffs even more, you may consider one of the cruises that usually depart from Doolin pier (we didn’t have the time to do it). 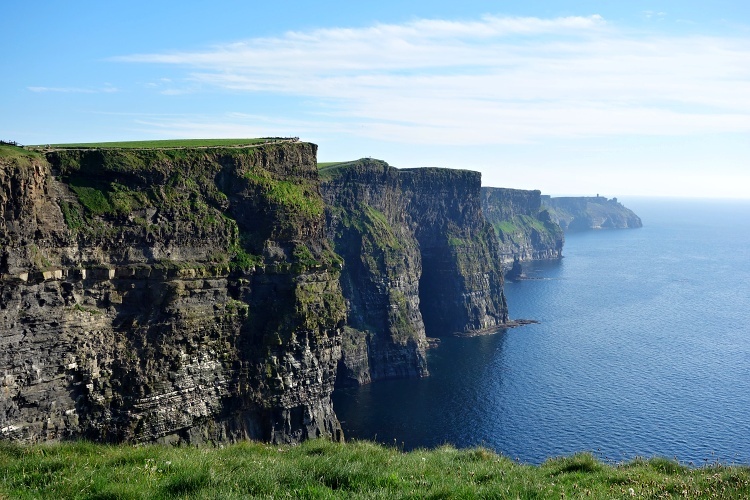 You shouldn’t miss the Cliffs of Moher on your trip to the west coast of Ireland, it is the ultimate Irish natural attraction. However, your experience will strongly depend on the weather. But hey, you are in Ireland after all so take it easy and be prepared! 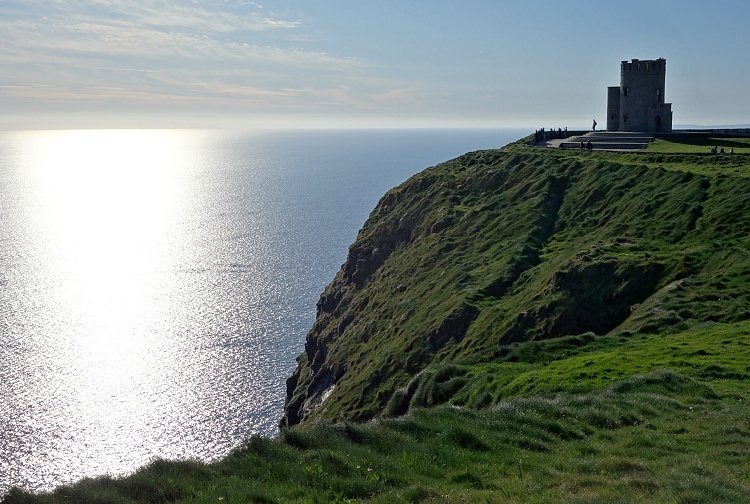 Are the Cliffs of Moher on your list or have you been there already? Let us know in the comments! Hello! I’m planning on visiting in June and we’d like to be there early in the morning before the Visitor Centre opens. Will we be able to walk the pathways and platforms that early or do you have to wait until 9 am? Thanks for your help! Hi Ashley, yes, it is possible to access the site and walk around before the Visitor Centre opens. Enjoy! Is it possible to access the cliffs for early morning sunrise and late evening sunset? The times I am interested in are outside opening hours. I also have a car that requires parking and from what’s been posted on forums it seems that a car cannot access the carpark as it is closed outside visiting times.